This blog is thus aimed to help and guide you through the process of nailing the external look of a modern farmhouse style abode just right. Everything from the roof to railings, garden to garage, it’s in the exterior of your residence that the most obvious modern farmhouse statement will have to be made. The color of the walls, the material of the doors, the style of windows you’ve opted for, all need to be taken into account. Here’s a quick rundown on the major elements you need to put your mind to. Natural woods are good to go and speak “farmhouse” like no other accent would. It’s through boards and battens that the countrified look in infused into the affair, with glossed doors and striking colors (such as the minimal black or white even the classic oak) to bring in the contemporary, more industrialized feel. Pay attention to your roof if you are getting ready to install a new one. Metal roofs are all the rage now as are, wood shakes. While on the interior a number of palettes and neutral colors of different kinds can be mixed and matched for the desired effect, on the inside you need a more minimalist black or white paint job. Ensure that the coat is not too boisterous or loud since that does not fall into the modern farmhouse aesthetic. Also bear in mind that while a classic farmhouse style is supposed to be mostly rustic, in a modern farmhouse style décor the pain job should be crisp, smooth, and well done. Go for the classic barn door style if you like, but bring a modern touch to the thing by using white, black or natural wood as the color of choice. The handles and knobs should be preferably black—for contrast. Keep it minimal and sleek. Bleached wood is also a great idea for the sake of contrast, especially against white. You probably know that in modern farmhouse style décor there’s a combination of modern and vintage style decorative items. There’s a balance to be achieved, and not just in the selection and placement of the decorative items but also in the selection and placement of dominant furniture, etc. 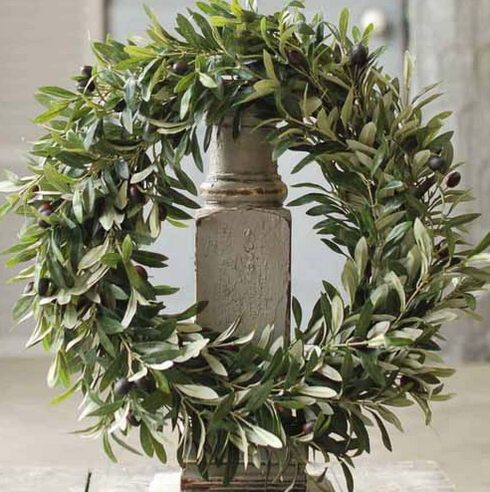 For an exterior botanical and natural, green accents can be added in the form of a faux wreath like this one. Make sure that the overall aesthetic is cozy and warm. Don’t overdo it, and since it is the outdoors, you can try growing real plants in urns to accentuate the look and add an element of earthiness to it. If there is space available, incorporate a wooden bench or two, Adirondack chairs or twig furniture for rustic appeal. In terms of lighting, go with schoolhouse metal lighting which is subdued and demure instead of bright and shiny. If you’re looking for decorative items to use for the exterior of your modern farmhouse style home, check out our amazing collection. From stoneware soap dish to faux olive branches, we have every decorative item that a farmhouse aficionado could think of.